A new type of computing device, the Intel Compute Stick enables you to transform a display into a fully functional computer via an HDMI* port. 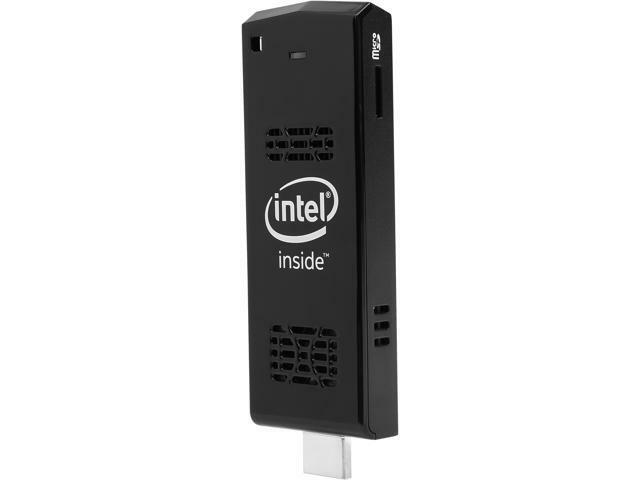 Ready-to-go out-of-the-box, the Intel Compute Stick offers the performance, quality, and value you expect from Intel. The Intel Compute Stick performs just like your other computers—just plug the Intel Compute Stick into any HDMI TV or monitor, connect your wireless keyboard and mouse and you’re ready to stream media, work, or play games. The built-in Wi-Fi, 32 GB of on-board storage, and pre-installed Windows 8.1 with Bing* enable you to be productive immediately. The Intel Compute Stick with a quad-core Intel Atom processor has the performance you need to stream media, play games, or create projects and has the quality and value you expect from Intel. The micro SD card slot gives you the option of additional storage, so you can access your files quickly and easily. Don’t worry about theft. The Intel Compute Stick comes with McAfee Antivirus Plus* for comprehensive protection from Trojans, viruses, spyware, and more. The compute stick also has a security notch for securing to objects with a cable, ensuring that your device moves only when you want it to. In the kitchen, den, or home office, your system and your files are with you, making it easy to work when, where, and how you want. It’s everything you love about your desktop computer in a device that fits in the palm of your hand. 4.06" x 1.46" x 0.47"
Cons: a little slow, but that was expected. Video drivers can do some weird things sometimes. Worked fine for six months. Fan suddenly stopped working. Now stick freezes about a minute after boot every time. Pros: Does just what I expected. Downloaded some software to it and it runs just fine. Cons: More memory would be nice.Although using a usb hub it reads external hard drives just fine.Don't waste your time trying to power it thru usb. It will work for awhile but then it won't. Just plug it in to the wall. Pros: Tiny, convenient, streams audio/video which is why I bought it. Cons: Slow internal flash read/write speed. After the third month the internal flash failed on the device, currently in the process of RMA'ing the device to get it repaired/replaced. Other Thoughts: Overall the product is a great idea, still seems to need a little work. Cons: Received device a 1 1/2 months ago. Less than 2 weeks ago it quit booting and requires that I contact the device manufacturer. I've tried for days to get ahold of Intel to find a solution without any luck. When I call the support number, it tells you 5 minute wait, but after 45 minutes or so, no one ever answers. I've tried updating the BIOs and still can't get the device to boot. If you have $150 to waste and have time to work out all of Intel's kinks in their product, then this device is for you. I do not recommend this device to anyone and think anyone with no computer experience will have a nightmare on their hands. Other Thoughts: After about 60 days it started experiencing the dreaded BSOD. I restored it several times but it just will not remain stable, and it will not upgrade to Win 10. It's a brick now. It was a fun experiment while it lasted, but this device up & died on me. I do not feel like we got value for our money. Cons: On some media intense websites like CNN, it can start to noticeably slow down but what do you expect form $150 all-in-one PC running a full version of windows 8.1? Also, when the fan kicks in, its definitely audible and I am usually sitting about 12 feet away from the TV and its plugged in to an HDMI port behind the TV. Other than that, it does exactly what I expected it to do. Cons: Problems since day 1 had to reformat twice now I cannot boot it and it is bricked. .. love the concept but has been junk since day 1. Pros: Turns any HDMI TV into a computer. Other Thoughts: It's a great device that I love having on my TV. It opens up a world of options as far as being a media streamer/media center PC. I did have to purchase a separate dual band Wifi NIC in order to see good enough wireless performance to find it usable, but I enjoy it immensely now. I can download at 100Mb/s or more, I can't tell because that's how fast my ISP caps out at 100. Great device for tech lovers.